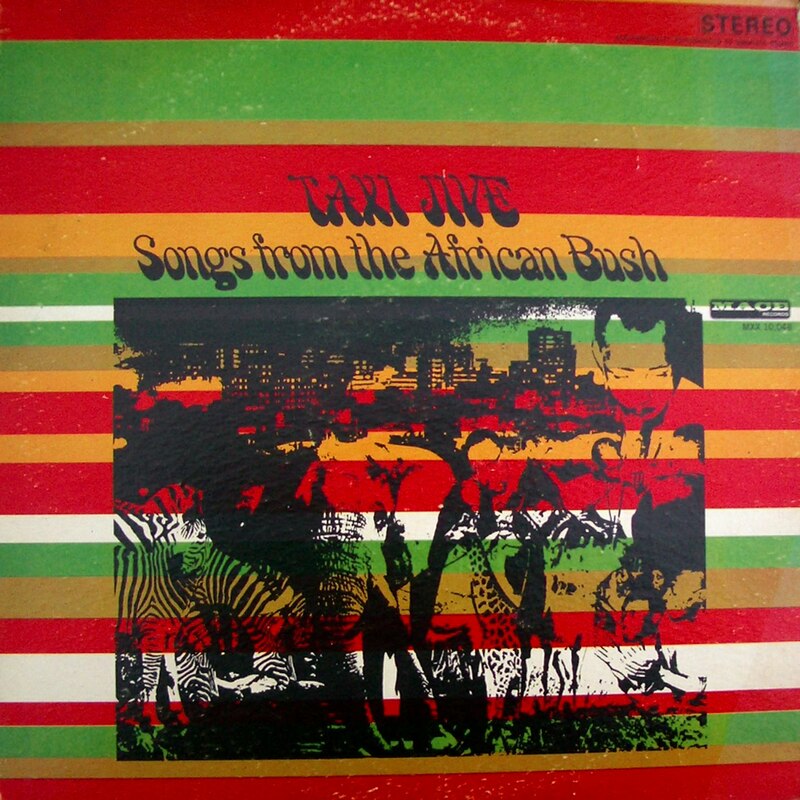 Not a lot of bush in this compilation of urban jive compiled for a foreign audience. The compiler did a good job though and the great examples of early electric jive more than compensate for plainly wrong sub-title and imagery. 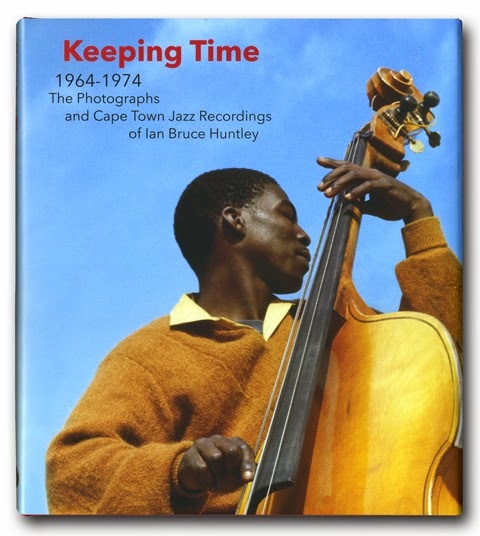 The Eight Gentlemen are almost certainly the Makhona Tsohle Band whilst Valenti's Rhythm Kings would probably be Boy Masaka's band of the time. The band names are modified for the American label. Update: photos of the labels from the original Troubadour compilation LP - suspect it was 1966 or 67? (Chris). Thanks for the share. I think the Eight Gentlemen line-up is a GRC or Trutone line-up rather than the Makhona Tshole guys - Gallo/Mavuthela never really utilised that percussion backing. Love Valenti's "Rhythm Kings" and Kid Margo. Thanks again! Mediafire file is infected with a trojan. Rapidshare file seems fine but not succeeded in downloading it yet. Your album listing says "c1965" -- so can we definitively say that the album came out in 1965, or is that just a rough approximation? Also, if the album came out in 1965, can we also assume that most or all of the individual tracks on the album were also originally released earlier in 1965, on 78rpm discs (as the liner notes say)? Or could it be that some of them date even earlier? The sound stylings on some of these are so modern that I can't imagine them having come out in 1963 or earlier -- heck, even 1965 seems amazing! I really like to know the release year of each song I'm listening to, so any info you might have about the date of this superb compilation album or of the individual tracks would be greatly appreciated. Thanks! Thanks for replying! Oh well -- It would have been nice to know more precisely, but the dates are apparently lost forever. "I am pretty sure this is a mid-late 1960's pressing of early 1960's recordings (note the ELECTRONICALLY RECHANNELED TO SIMULATE STEREO on top right corner)". Just based on my experience with the history of graphic design, the style of the album cover is much more likely to be from '68-ish, especially the font and the color scheme, which would have seemed futuristic even on an American rock album from 1965. But seeing as it is a compilation of earlier recordings, I guess I'll just have to stick with "c1965" for lack of a better date! As an aside, WFMU radio must have downloaded the Taxi Jive album from this post as used it for their show on 4-12-11 because they repeat the "ca 1965" attribution (http://wfmu.org/playlists/shows/39918). You're more influential than you realize! If we can find the dates of any of those records, we can find the date of Taxi Jive! I'll try add my two cents to the dating of the "Taxi Jive" LP. 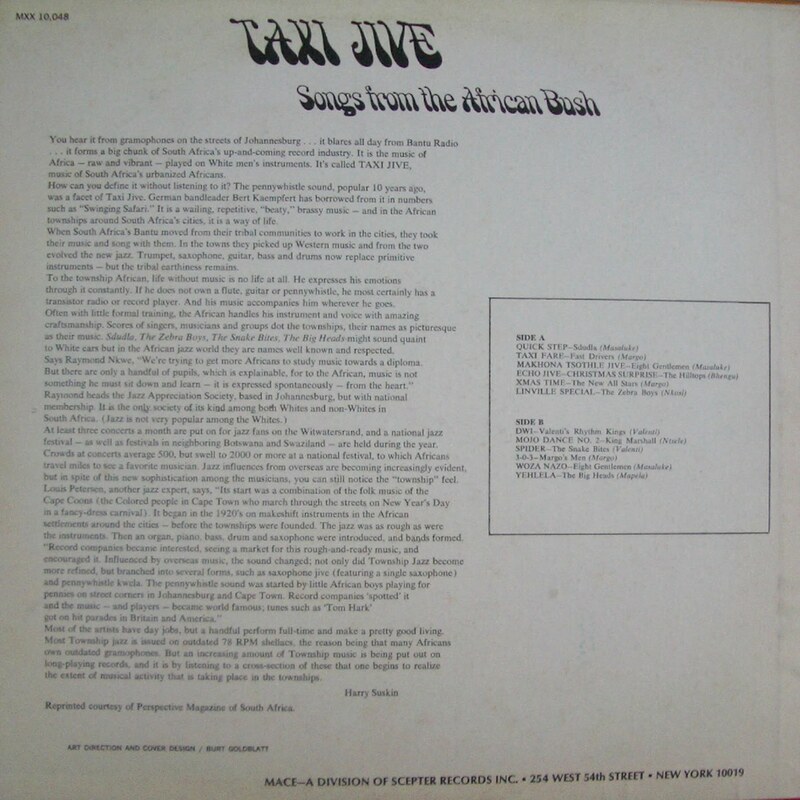 The MACE record is actually a US reissue of an earlier Troubadour LP "Taxi Jive" (TRL - AFC 11). I found a black and white image of the original cover which is different from the MACE version and will post it here soon. Troubadour was consumed by Gallo in 1969 so the record definitely predates that. The image was amongst a series of covers on the back of the compilation LP "Pelindaba Special" (Troubadour, TRL-AFC 16). Looking at all the various designs of those 15 LPs, my instinct tells me that "Taxi Jive" probably came out c1966 or c1967. But certainly c1965 is also possible. Also the liner notes on the MACE LP mention the manufacture of 78 rpms in SA and I think these were made there up until 1968. Kid Margo, Jimmy Masaluke, Sammy Bhengu all recorded for Troubadour throughout the 1960s though I have noticed that their 78 rpms that I have date between 1964 and 1967. I also have a King Marshall 78 rpm on the HIT label from 1966. Also Troubadour had another label "Modern Jive"and I have one 78 rpm on that label (MOD 22, quite a low number) which dates from 1967. In the grid of Troubadour covers on the back of the Pelindaba LP, there is also a compilation called "Modern Jive" with an identical "Op Art" cover to the label's 78 rpm sleeve. This LP TRL-AFC 9 predates the "Taxi Jive" album. My first thought is how long would it have taken for Bridget Riley to trickle into South African record design? Anyways, I would guess the LP was issued c1967 but the original 78 recordings certainly could range from 1965 to 1967. That's more than two cents -- that's a goldmine of new info! Great research. First of all, the fact that the Mace release is just a re-issue of an earlier release on Troubador renders all my speculation about album design and other albums in the Mace catalog irrelevant. From a careful reading and re-reading of your key final paragraph, it seems that Taxi Jive almost certainly must have come out in 1967, then. 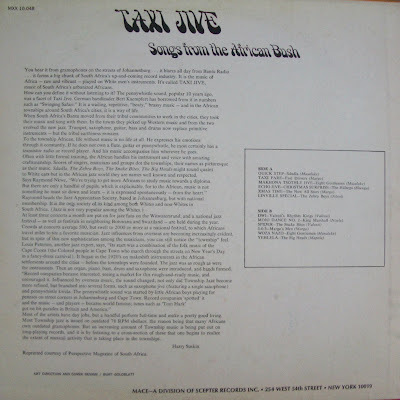 The original Taxi Jive release on Troubador was depicted on the back cover of a different Troubador album with a slightly later catalog number. That latter album could not have come out any later than '68. Also depicted on that same back cover is a different record known to have come out in '67. So the album with the back-cover pictures could not have come out any earlier than '67, either. From this, we know that Taxi Jive recently preceded an album that MUST have been released in '67 or '68. The odds are then strongly in favor of '67, with '68 and '66 outside possibilities. So, unless new info comes along, I'm going with 1967 as the likely release date of the original edition of Taxi Jive, and am now changing the date from '65 to '67 on my mp3s, even though admittedly the individual tracks could be from any year prior to '67, it being a compilation of previously released singles. Yes 1967 (or 1968) as I have a copy of Echo Jive Xmas Surprise on the original 78 and the recording date was 1967! This will be listed on eBay later today! Hi. Nice work ! But the links are down.